The White Horse Inn – Cwmtillery. 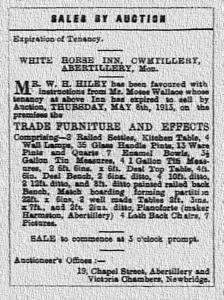 The White Horse Inn was one of the oldest inns in Abertillery and was situated on Club Row, Cwmtillery, where White Horse Court housing complex is today. Both Club Row and the White Horse Inn were built on leasehold from the 21st December 1842. In the 1840’s Mr Daniel Jones was the landlord. In 1849 a policeman named Mr Samuel Addison accidentally shot the Landlord Mr Daniel Jones with a six barrel pistol, the shot struck his arm and it later had to be amputated. At the time of the sinking of the Penybont Tillery Colliery 1848-1850 the colliery proprietors gave the sinkers teams a celebratory dinner at this Inn. During the 1860’s Mr James Jones was the landlord. In June 1861 he appeared at Blaina Court in front of the Magistrates Messrs Frederick Levick (owner of the Blaina & Cwmcelyn Iron Works) and John Russell (owner of the Cwmtillery Colliery) charged with opening the inn on a Sunday and was fined £1. equivalent to £116.00. in today’s money. In April 1876 Club Row and the White Horse Inn was put up at auction at the Kings Head Hotel, Newport. 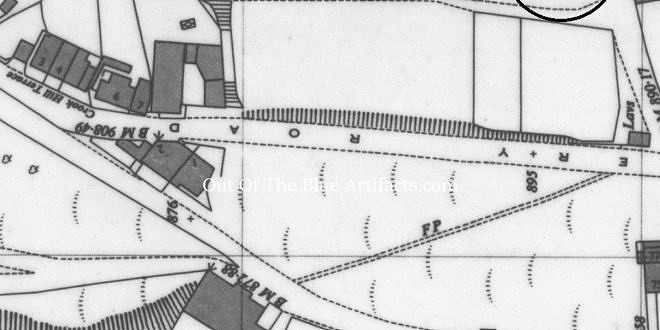 It was stated on the sales sheet (as seen left) that the lot consisted of – Twenty cottages and the White Horse Inn on leasehold, situated close to the South Wales Colliery Company (Cwmtillery Colliery, Tyr Nicholas) works and currently rented by them. The lease, as stated, was from the 21st December 1842, this was at the time Cwmtillery Colliery (Tyr Nicholas) was being developed by Mr Thomas Brown Esq. Then later Mr John Russell took control of the colliery. In 1864 Mr Crawshay Bailey set up the South Wales Colliery Co to buy the Cwmtillery Colliery (Tyr Nicholas) from Mr John Russell who had put the collieries on the market for sale at £66,000. After the purchase of the Cwmtillery Colliery, the South Wales Company bought up a lot of property to add to it. In the same year they purchased Club Row and the White Horse Inn, they also purchased a row of cottages and an Inn in the grounds of Cwmtillery Colliery, the latter later become the original South Wales Inn and they bought the Wain Vawr House at Risca for Capt Lawrence Heyworth the director of the company. Capt Lawrence Heyworth later designed cottages at Cwmtillery and had them built along with cottages at Clyn Mawr, Blaenau Gwent Rows. In the 1870s Mr John Wallace and his wife Sarah Ann were the licensees, Mr Moses Wallace was the last landlord before its closure. 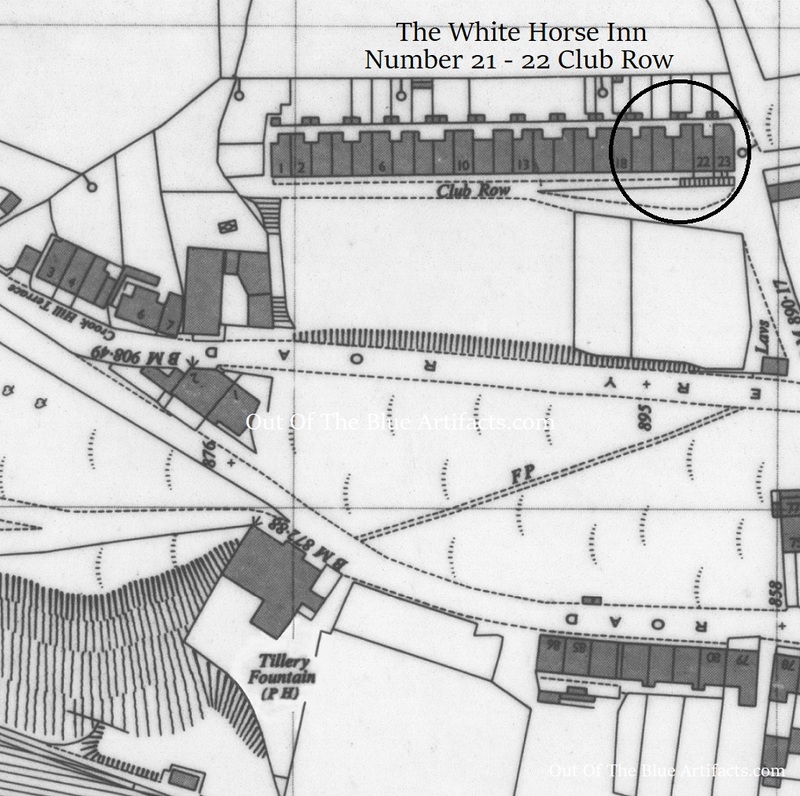 It was stated in court papers that the White Horse Inn occupied 2 cottages in that row No’s 21-22. On the 1963 official council map there were 23 houses on Club Row. The White Horse Inn was sold at auction in 1913 and the White Hors Inn was converted to a house, houses. In the 1960’s-70’s the houses on Club Row were demolished and later the White Horse housing complex was built on the site. There are no known images of this inn.